Sat., Sept. 3, 2016, 9:44 p.m.
GAINESVILLE, Fla. – After having Florida Field named after him and then leading 90,000 rain-soaked fans in a pregame cheer, Steve Spurrier did something no one could have seen coming. He posed like Olympic sprinter Usain Bolt. 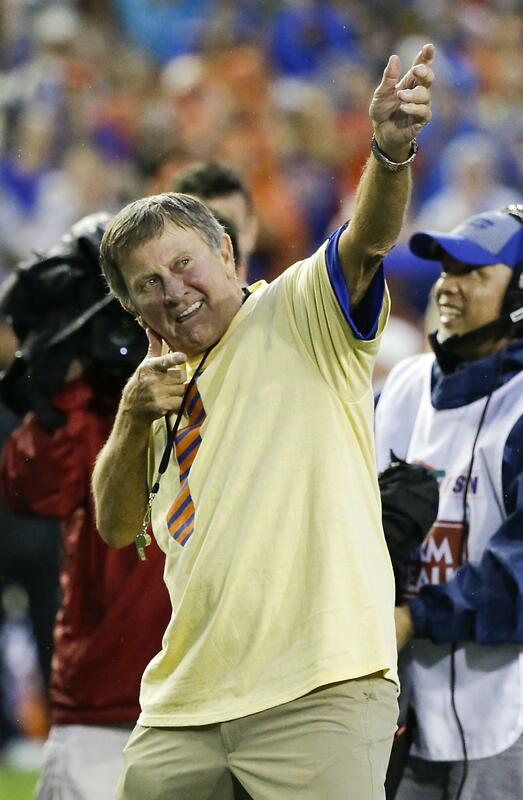 The 71-year-old retired coach flashed Bolt’s “To The World” pose to all four sides of the newly renamed Steve Spurrier-Florida Field at Ben Hill Griffin Stadium on Saturday. It drew a raucous ovation from fans on hand for No. 25 Florida’s season opener against UMass, which the Gators won 24-7. Many of the fans were there for Spurrier, who was honored in a number of ways. Not only was the field named after him, but Spurrier served as the honorary “Mr. Two Bits.” At halftime, he was recognized again for the 50th anniversary of his 1966 Heisman Trophy and honored along with the 1996 national championship team. After the title team was showered with praise, former Florida players Thaddeus Bullard, Zach Piller and Deak Story lifted Spurrier on their shoulders and carried him toward the sidelines. Spurrier said the highlight of the day was the stadium renaming, when he got a chance to thank his coaches, teammates and players. He also thanked the Florida band for wearing visors to pay tribute to him. “A lot of people didn’t see that, but that was one of my favorite parts, too. Man, they were well dressed. Well dressed,” he said. Published: Sept. 3, 2016, 9:44 p.m.